DEFIANCE, OHIO TOUR MARCH 2015! It’s been a long time since we’ve had much news and even longer since we have toured, So…. DEFIANCE, OHIO – This is the band’s first tour in almost two years, and their first tour with all six members in at least twice as long. 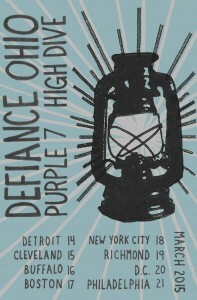 Defiance, Ohio has been touring and recording music for over a decade. Known for acoustic-influenced, socially conscious, and undeniably catchy punk anthems, their career that has included four full-length albums and shows on three continents. Their most recent release is 2012’s “The Calling” EP on No Idea Records. PURPLE 7 – Based out of Bloomington, Indiana, and boasting a long and respectable list of “members of” bands including Defiance, Ohio, Hot New Mexicans, Landlord, Door-Keys, and Nana Grizol, Purple 7 is surely at least as great as the sum of it’s parts. Whether it’s garage-rock, psychedelic, or something else entirely, this is three-piece rock ‘n’ roll as it was intended to be. Their most recent release is 2014’s full-length, “Jewel Finger” on Basement Pop records. HIGH DIVE – Also from Bloomington, Indiana, High Dive is the product of three distinct songwriters: Ginger Alford (formerly of Good Luck & One Reason), Toby Foster (a solo artist in his own right), and Richard Wehrenberg Jr. (most notably known for his poetry and work with Monster House Press). This powerpop five-piece keeps the riffs short and tight, the lyrics direct and honest, and the melodies worth remembering. They recently wrapped up a three-week European tour which included a coinciding EP on Yo-Yo Records. Come back to Columbus. We love you and miss you here!